Welcome to Operation Transformation. This series aims to go right back to basics, say goodbye to crash diets, ditch the fads and start eating real food. The food plan we’ve created will help you and your family reach and maintain a healthy weight for life. Weight loss isn’t achieved by restricting yourself and going hungry. That’s why on my plan you’re going to eat breakfast, lunch, dinner, and two snacks every day. Skipping meals will not help you lose weight! 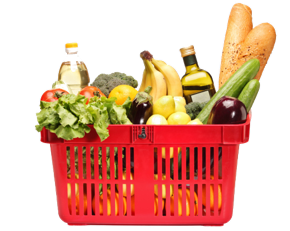 The food plan is available online. You’ll find breakfast, lunch, and snack options for you to chose from. The shopping lists for the dinners are also all available online. To reap the rewards of this food plan you need to weigh, measure and portion your food properly. So dig out your scales and no more guessing! We can’t stress this enough- Preparation and planning are key to staying on track with any food plan. When doing your food shopping, keep in mind not all products are created equal so make sure to read the labels. For example, you may see two peanut butters that look the same but one might be 100% peanut with no added extras. This one is perfect! Where as the other option may have added palm oil and sugar. A far less healthy option! Remember, just because a label says low fat doesn’t make it the healthiest choice. Watch out for added substitutes. Long lists of ingredients tend to mean unnecessary extras. We always say, if you don’t recognise an ingredient, don’t put it in your body! Nutritional labels can be confusing but a good guide is to follow the 365 rule. Look to see the nutrition content of 100g on the label and aim to only buy foods with up to 3g fat, 6g fibre or more and 5g sugar or less. And finally when following the plan aim to have 2 litres of water regularly throughout the day. Drink tea and coffee in moderation but cut down on sugar and milk as much as you can. And remember calories count in liquid form too! Alcohol needs be kept to a minimum and fizzy drinks are to be absolutely avoided. We’re here to help you every step of the way so if in doubt remember you can always Ask the Experts online!